Chancel Bells is our high school/adult handbell choir that is flexible, fun and offers good fellowship. We rehearse for roughly 6 weeks per session, meeting once a week, Thursday nights, from 8:00-9:00 p.m., then play in worship. Our schedule for the program year is (approx. ): Mid-October, Advent Lessons & Carols in early December, Christmas Eve, mid-February, mid-April and early June. Ring for one session, ring for all! We have 5 octaves of Schulmerich handbells and 3 octaves of Schulmerich MelodyChimes. From Mid-June to Labor Day week-end we have a casual 8:00 a.m. communion service at Gillson Park, looking out on beautiful Lake Michigan. 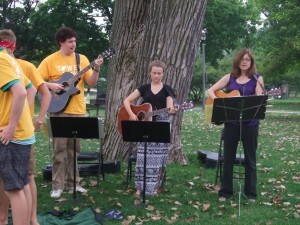 Guitars provide our music and accompaniment for singing. If you play a little or a lot, consider joining this group for one Sunday or all. Rehearsals are mutually agreed upon by the members and are flexible.